Jsp engine calls jspInit() method only once during the initialization phase of a jsp. For each client request Jsp container calls _jspService() method once. When client request comes for a jsp for the first time , jsp engine makes a full read of the jsp verifies the syntactical corectness of the jsp elements and converts code into a servlet source code . The process of JSP engine translating jsp into servlet nothing but translation phase of JSP. Container generated servlet class is also known as page implementation class. 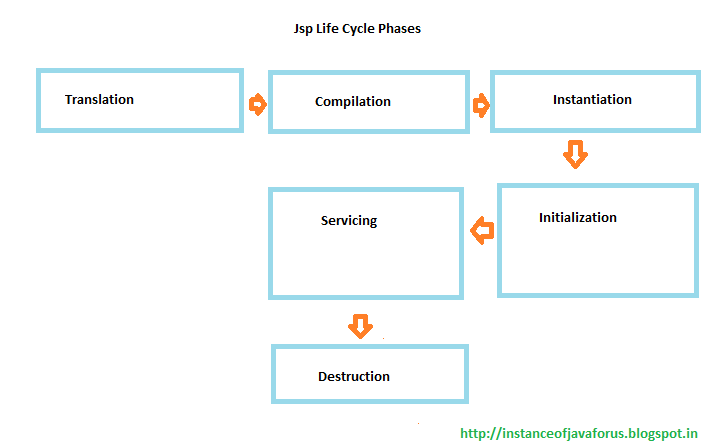 The process of jsp engine compiling the page implementation class is nothing but compilation phase of jsp. Jsp engine uses JASPER compiler to compile the container generated servlet class source code. In the life of the Jsp Translation and compilation happens only once unless jsp source code modified. actually now we have a servelt object. Servlet engine creates the instance of loaded servlet class. Servlet engine uses the following piece of code to load the servlet clas dynamically to instantiate it. 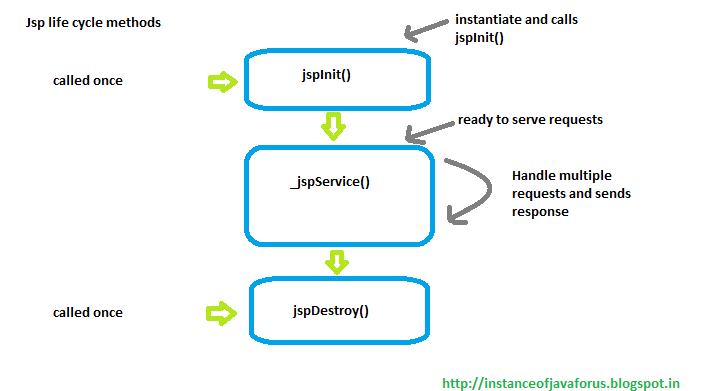 Once init method completely executed servlet is ready to serve the client request. Once service method is completely executed , client request is served and request-response cycle is complete.